There is possibly no other single musician who has defined the state of Latin Jazz more than Eddie Palmieri, who turns 81 years old today. Over the phone, Palmieri toggles between Spanish and English, punctuating his phrases with hearty, ample laughs. The trumpet player Alfredo 'Chocolate' Armenteros taught him that at 50, "you can start counting again at 1... so, I'm really only turning 31 on December 15!" At his venerable age, maestro Palmieri is still in superb form, as shown during a recent live performance alongside Cuban-born violinist Alfredo de la Fe, percussionist Nicky Marrero, as well as Camilo Molina, Luques Curtis and Little Johnny Rivero, below. Palmieri's music masterfully displays the funk and soul of his Harlem birthplace and his early home across the city in the Bronx, knitting together Afro-Cuban beats, but also the influences of the great jazz musicians who were his contemporaries. Palmieri specifically mentions learning how to "play the silences" from jazz pianist Ahmed Jamal: "He would play a melody, he doesn't finish, he gives you that space. The mind can anticipate the melody that he's not playing — he's a genius. He's the one that taught me that 'less is more.'" 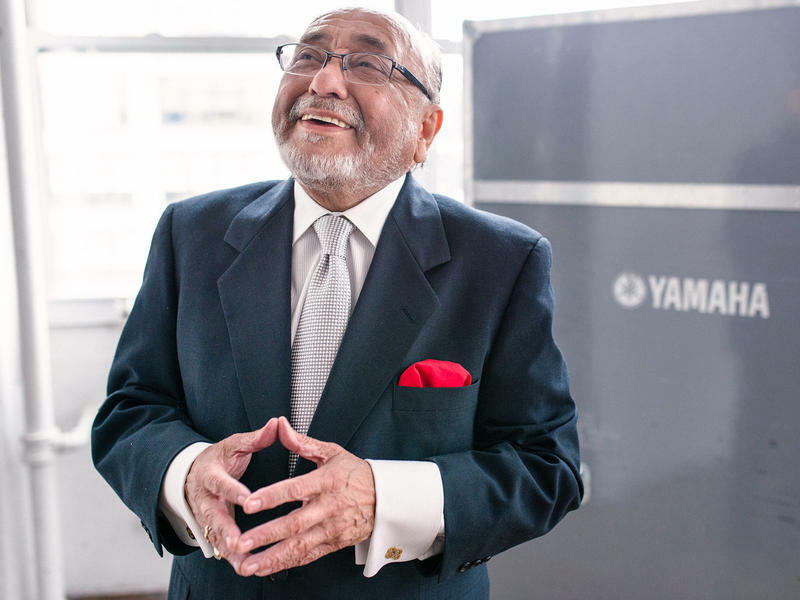 A recipient of the Latin Academy of Recording Arts & Sciences Lifetime Achievement Award and a National Endowment for the Arts Jazz Master, Palmieri summarizes lessons he has learned from life in one word: "... that word is 'preparation.' When preparation meets opportunity, they'll say, pero mira que suerte tuvo este -- 'Look how lucky this guy was!' No, no! He was prepared and the opportunity was there and it clicked." He credits as major influences two books: Ukrainian-American composer Joseph Schillinger's The Mathematical Basis of the Arts and economist Henry George's "masterpiece," Progress and Poverty, which cries out against the inequality and poverty of industrialized societies. Palmieri says that the effects of the "villain" of poverty inspired him to compose his own masterpiece, Harlem River Drive, recorded by a band co-led by his brother (and master pianist in his own right), Charlie Palmieri. Palmieri denounces the poverty that still exists in the U.S. today, exclaiming: "Every day is more of a struggle. Everything goes up but the wages!" Yet he affirms that music plays a role in alleviating many kinds of difficult circumstances in life, mentioning his frequent concerts in prisons such as Attica, Lewisburg, Sing Sing, Rikers Island. The effect is a two-way street; the joy of music keeps him from the Grim Reaper, he says, noting that "today, we even have a president who is dangerous! One mistake between us and North Korea, and it's the end of civilization." So, his advice is short and to the point: "Enjoy your life every second that you can! Es un peligro estar vivo, pero muerto no se puede vivir" — "it's dangerous to be alive, but it's not much of a life if you're dead." Palmieri appears to be taking his own advice; he's already putting together another album in honor of his deceased wife, titled Mi luz mayor, produced by his son and manager, Eddie Palmieri II. It is set to feature a 20-piece orchestra and some notable guests, including Carlos Santana and Gilberto Santa Rosa. We can hardly wait, and wish Maestro Palmieri a happy birthday — y muchos, muchos más. Copyright 2018 NPR. To see more, visit http://www.npr.org/.